I've "played" a few idle games. Cookie Clicker was my first but I've also enjoyed the depth of Realm Grinder and Clicker Heroes. If you've never played one then you're not missing out on much. The ultimate objective is to earn more of the game's currency. The process never really ends but idlers tend to have some sort of prestige mechanic where you can reset your progress for long-term benefits that accrue over time so you can have days of milestones to reach. This helps to keep at least one carrot on a stick in front of the player at all times. 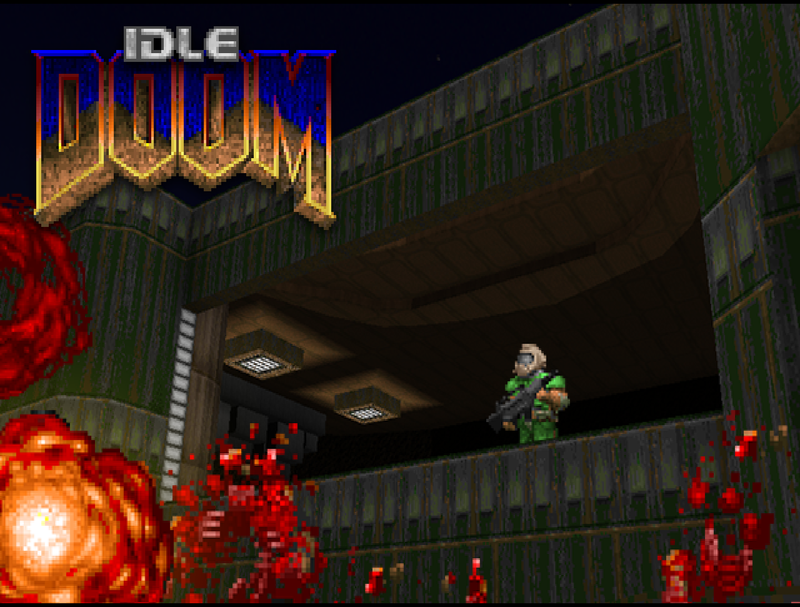 Idle Doom is an interesting experiment that explores the very basic mechanics behind these clicker games within the framework of ZDoom. There's at least one significant difference: you can actually reach an end. It also has a story. Doomguy is relaxing when he has an idea to effortlessly depopulate Hell by creating a death chamber with automatic weaponry and using a teleporter to pull monsters into it. He brings it up to the UAC by way of his good friend, John Science, who reports back that his bosses aren't going to put forth all of the funding but are willing to slam together a bare minimum proof of concept - one pistol-firing turret - and upgrade it as its efficacy is proven. Doomguy is understandably pissed but he's willing to go along with it, especially since it involves practically zero work on his part. The setting works. It's some kind of lab overlooking an outdoor area that resembles the secret annex of "Entryway". You can see a private viewing gallery on the right full of marines. There are a bunch of unmarked buttons but Albertoni's design is a stroke of genius. "Using" them informs you as to what they do and physically punching them activates them. It's a great way to keep the design simple without punishing the player for being naturally inquisitive, exploring the same way they would during a normal level when confronting a switch. You can't directly interact with the monsters, only the three rows of switches. 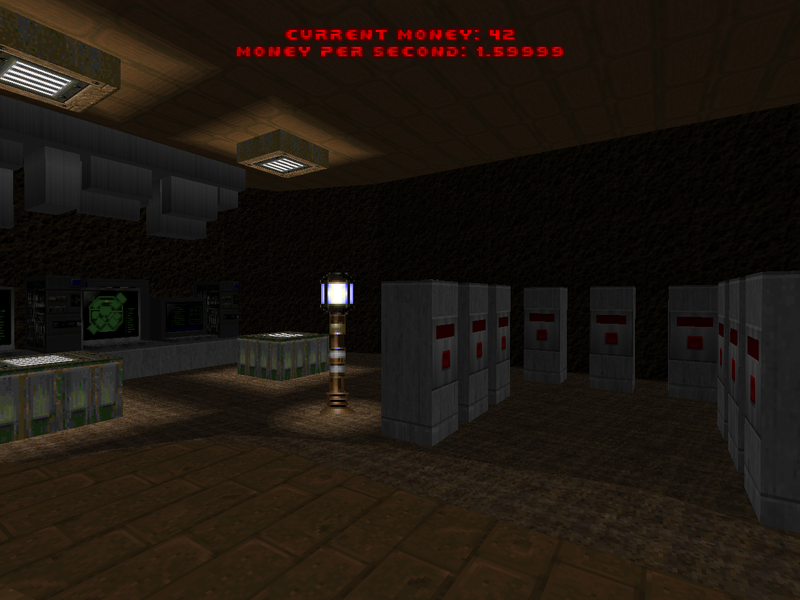 One of the banks controls the type of enemy that spawns. The center button allows you to upgrade to stronger varieties who are worth more credits when they die. It starts at zombiman and then moves through shotgun guy, imp, demon, revenant, Hell knight, Baron, and Cyberdemon. You use the side switches to adjust which particular Hellspawn appears. This is an important function if you bit off more than you can chew by, say, swapping to ol' Cybie without an adequate weapon available. The only other use I can imagine would be letting a bunch of revenants pile up and then wipe them all out for the sheer visceral experience. The opposite group handles which weapon is currently active and starts at the pistol and moves through plasma gun, shotgun, SSG, rocket launcher, and BFG. It isn't immediately obvious where the attacks are coming from but the first upgrade reveals that the tech columns at the back of the yard emanate the projectiles. You might wonder why the PG is tiered so low or why you would want to change your weapon to a previous one but rockets are less efficient against Cyberdemons when compared to the SSG and rate of fire is its own variable, upgraded via one of the buttons on the back row. One "shot" is a pistol puff is a plasma ball is a shotgun blast, etc. so a single plasma hit pales in comparison to the concentrated potential of the regular shotty. The other two back switches upgrade how many tech pillars you have active - starting at one and moving toward three - while the other controls the rate at which monsters spawn in. None of the rear-positioned buttons control the magnitude of their effects. They only move in one direction but there isn't really a downside to improving them. The cost of everything scales with each purchase. Cyberdemon-tier is significantly cheaper than the BFG level but both are dwarfed by the price of the highest attack rate upgrade. The road is already run by the time you have the first two, though, since there will be nothing left to aspire to apart from further weapon speed improvements. Most idle games excepting, say, A Dark Room do not have an end game condition. The entire premise is founded upon the process of acquiring more of the available commodities and the player's sustained interest is generally increased by adding ever more milestones. You never stop earning but the magnitude of your progress eventually tapers off. 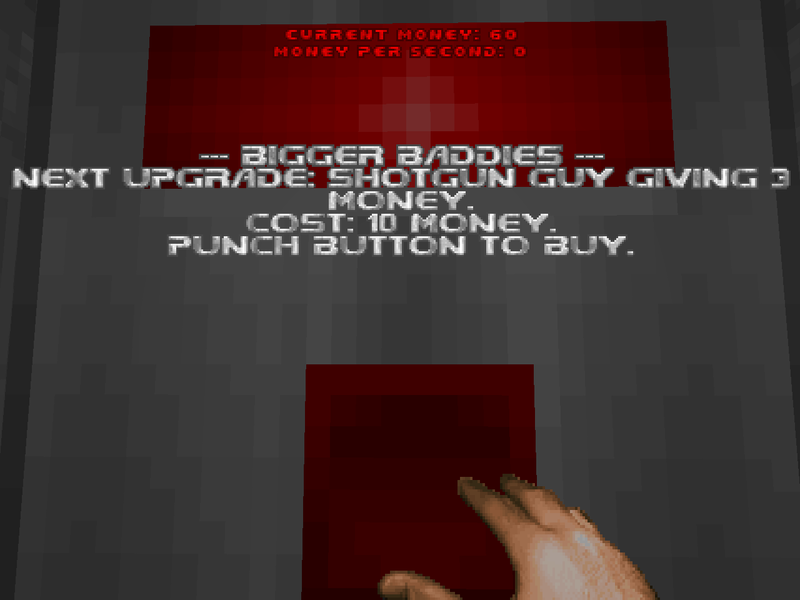 As I mentioned earlier, though, you can actually finish Idle Doom. The exit door opens once you've purchased every single upgrade. This is mostly a function of the final attack rate price which is considerably higher than the cost of the Cyberdemon and BFG combined. You'll barely notice a difference, though, since you'll still be atomizing the big lugs about as fast as they appear. IDLEDOOM is may be an amusing diversion but I think that it's also a solid proof of concept insofar as it takes the principles of idle games and successfully translates them to Doom's first person shooter paradigm. I could see someone improving and iterating on this format to make a fully fleshed-out "clicker game", so to speak. The one thing that I would change in order to bring the base experience in line with entry expectation is to give the player an analogue to manual mouse clicks. I understand that it's both inevitably outpaced by the passive component and counter to the idle ideology expressed in the title - especially to people unfamiliar with the genre - but the experience feels bereft without one. I like Idle Doom. It's a working execution, it doesn't take itself seriously (how could it? ), and has plenty of potential provided that players have a penchant for not-quite-passive pastimes. I wouldn't mind seeing expanded releases in the future. My first idea for a Doom-related clicker game is far more insular, would stick with the browser presentation, and most importantly remains a thing of pure fantasy. This is so much more visceral.